From the Hancock County Courthouse, go east on Hwy 16 for 2.7 miles. Turn right on Rock Quarry Rd (Rd. 51). Go 2.3 miles to an old field or logging road on your left. 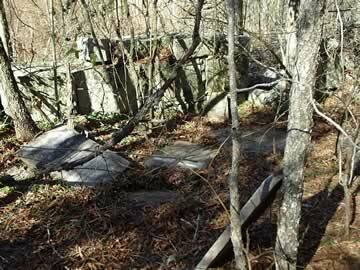 The cemetery is about 100 feet from Rock Quarry Road and on the right side of the old field road. This cemetery was once a fine old cemetery surrounded by a granite wall. However, vandals have knocked over and broken the stones and have knocked out some of the blocks of the granite wall. This cemetery is probably a haven for snakes. Visit it only in winter, when the danger of snakes is at a minimum. On same headstone with Mary E. Brooking. See epitaph under her grave entry. On same headstone with Joseph Brooking. See picture under his grave entry. On same headstone with Rebecca J. Brooking. See inscription under Rebecca's listing. "Nor youth, nor health, nor virtue all combined, Can save from death, nor yet is God unkind." On same headstone as Emily A. H. Brooking. "Died in the 19th year of her age." "She was the youngest child of Edward B. and Rebecca A. Brooking"
Died 3 Aug 1836, aged 17 mos. Eldest son of William and Maria L. Taylor. Child of _______ and Ann B. Rees. On same headstone with Thaddeus Beall Rees. Headstone in fragments. Only "eus Beall" appears now as name (stone broken). Child of ___ and Ann B. Rees. On same headstone with William Edward Rees. Headstone in fragments.